Defoamers Market size was worth USD 2.9 billion in 2015 and is forecast to witness gains of 4.5% CAGR. Rising market size for paper & pulp sector is anticipated to be the major driver for global defoamers market size. The industry will witness a remarkable growth owing to its wide range application as surface agents in manufacturing of paper & pulp products to meet the expanding market demand. The demand for paper-based flexible packaging materials in the packaging industry will rise on the account of growth in e-commerce and popularization of door-step delivery system of home appliances and other products. Global paper & pulp industry recorded over USD 550 billion in 2015 and is anticipated to have a healthy growth in coming years. Increasing awareness about water treatment is also expected to propel the global defoamers market size in the upcoming period. With several regulatory bodies mandating treatment of waste water from industry, demand for water treatment chemicals will rise significantly. Water treatment chemicals market was valued at over USD 25 billion in 2015 and is expected to reach USD 40 billion by 2024. Another major driving force of the market is expected to be the growing paints and coatings industry because of its rising end-user market which includes construction industry as well as automotive industry. With growing population, coupled with rising GDP and enhancing social status, a substantial growth is expected in the major end-user segments of the paints and coatings industry. Global paints and coatings industry registered a total revenue of over USD 200 billion in 2015 and is anticipated to cross USD 350 billion by 2024. Increasing demand in the food and beverage industry is likely to propel the market in the forecast timespan. Global food and beverages additives were worth more than USD 40 billion in 2015. With escalating market trend towards the consumption of aerated cold drinks and fried food products, the industry will have a decent growth in the near future. However, regulations concerning the amount of defoamers to be used in the industry may act as a restraint to the market growth. Concentration rules in food and beverages established by the FDA and listed in the Code of Federal Regulations (CFR) have a possibility to hinder the market. Silicone defoamers market size finds huge demand from the pulp & paper industry owing to their good washing performance, lesser deposits and lowering the biological oxygen demand of the effluents that are disposed in the water. In 2015, these accounted to more than 40% of the global defoamers market share and is expected to grow at over 4% CAGR in terms of revenue from 2016 to 2024. 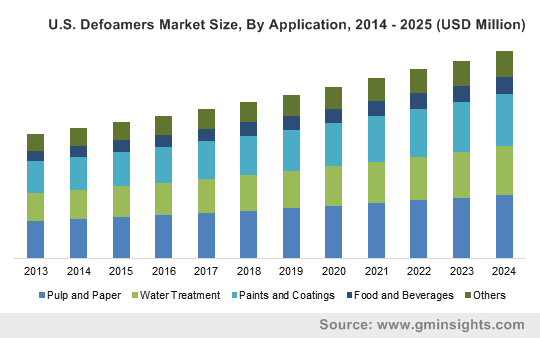 Water-based defoamers market will also witness a notable growth from a market size of over USD 550 million in 2015. Environmental advantages of these product types give them an additional benefit over other types. Oil-based products have almost a quarter of the global share and will have a slower growth in comparison to water-based and silicone-based counterparts. Pulp & paper industry is the major application sector and accounted for more than 30% of the global defoamers market share, at just over USD 880 million in 2015 and a steady growth will be catalyzed by the increasing demand among several end-user industries including packaging industry and stationery. However, due to increasing digitalization in the developed countries of Europe, paper & pulp segment will have a lower growth rate in these regions. Water treatment segment accounted for over one-fourth of the global market share and will grow significantly throughout the forecast period at CAGR over 4.5%. With growing environmental concern about treatment of waste water and sludges before disposal in natural water bodies, the global defoamers market size is anticipated to show a consequential growth. Asia Pacific, driven by India and China defoamers market size accounted for more than 35% of the global revenue. It is also expected to be the fastest growing region with over 4.5% CAGR in terms of revenue from 2016 to 2024. Healthy rise in paper demand in addition to the prevailing and developing agrochemicals industry in this region is expected to catapult the market in the upcoming years. Europe defoamers market size registered over USD 650 million in 2015 and will be influenced by a growing demand for paper & pulp in the packaging industry of the region. North America is expected to reach USD 800 million by the end of 2024 with a moderate growth rate. Global defoamers market share is fragmented with the top six manufacturers accounting to less than 25% of the global market share. Key industry players include Dow Corning Corp, Evonik Industries AG, Kemira Oyj, Ashland, Inc., Bluestar Silicones, and Air Products and Chemicals Inc. Among other notable market participants, there are BASF SE, Wacker Chemie AG, and Clariant. Major Companies operating include large chemical companies with dedicated manufacturing technologies and high experience and expertise to produce defoamers. Defoamers are chemical additives that reduces foam formation in several industrial processes. Foams or froth formation often hamper the cleaning process in the industries and need to be controlled. In water demanding industrial processes such as pulp & paper industry, where cleaning and removal of foam from the surface of the pulp is an essential step, these find an important application. The growing pulp & paper industry in Asia Pacific region will have a positive impact on the market throughout the forecast timeframe. With major manufacturers shifting their focus towards the huge demand in this region, a healthy growth is anticipated.